Fluffy yet moist thanks to mashed banana mixed into the batter, these pancakes make for the perfect weekend morning breakfast. Thick, airy, fluffy pancakes are good for the soul just as much as hard, cakey pancakes are bad for the soul. And I fully admit, I’ve made plenty of both. 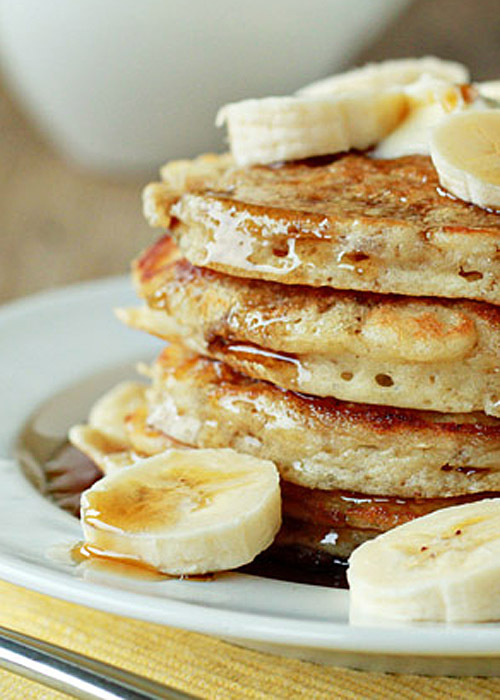 But don’t worry, this banana pancakes recipe is airy, fluffy, and perfect. 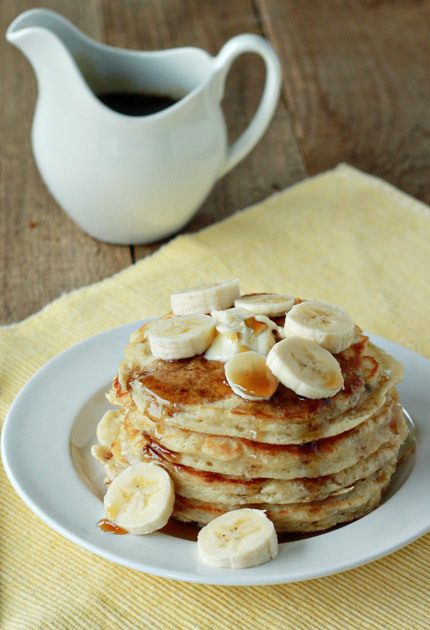 There are several methods out there for making your pancakes light and fluffy … read more or learn how to make banana pancakes right here! Add the buttermilk to a large bowl. If you’re using the vinegar plus milk option, let sit for about 10 minutes to allow the milk to turn to buttermilk. Whisk in the mashed banana, eggs, butter, and vanilla into the buttermilk. Pour the dry ingredients over the wet and mix just until incorporated. Do not overmix! Heat a non-stick griddle to 325 degrees Fahrenheit or place a large frying pan over medium heat. Melt a little butter on the cooking surface, spreading it evenly, if desired (or if the griddle/pan is not non-stick). Using a 1/3 cup measure (or a trigger-handled ice cream scoop works as well), pour the batter onto the griddle or into the frying pan. The pancakes are ready to flip when they look a little dry around the edges and start to form little bubbles (about a minute). Flip and cook on the other side until golden brown and the cooked through. Use almond milk instead of cow’s milk and use coconut oil in place of butter. Use pure maple syrup instead of granulated sugar. Got leftovers? Freeze these bad boys in an airtight bag then just pop a couple in the toaster for an even easier banana-pancake breakfast. I love pancakes. A little too much, probably. They’re easy, my toddler will eat them, they lend themselves to all kinds of delicious fruity mix-ins, and, when you’re really going for it, you can soak them with rich butter and sinfully-sweet pure maple syrup. Oh, but hey! These have bananas. 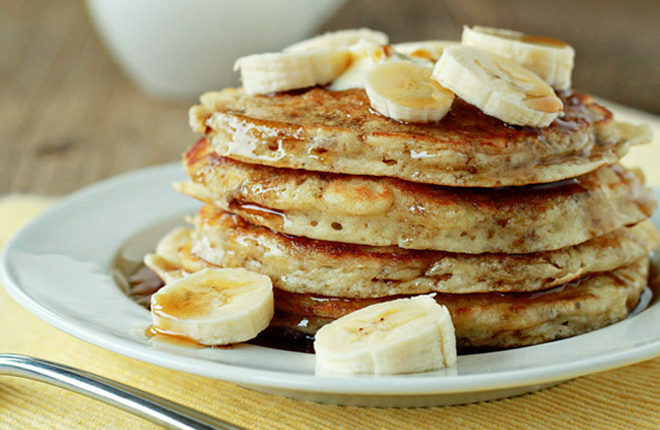 So these fluffy banana pancakes are totally healthy. Okay, so, not really. This banana pancakes recipe is a bit of a splurge. Seriously, though? Totally worth it. Every single bite. Thick, airy, fluffy pancakes are good for the soul just as much as hard, cakey pancakes are bad for the soul. And I fully admit, I’ve made plenty of both. There are several methods out there for making your pancakes light and fluffy. One of the most popular is to beat only the egg yolks in with the batter, reserving the egg whites and whipping them into a frothy frenzy before folding them into the otherwise-finished batter right before cooking. Effective, sure, but anything involving the word “frenzy” before 10 a.m. is not happening in this house. Me, I take a lazier approach to making fluffier pancakes. I add a little more baking powder than usual, and I let the batter sit for a few minutes before cooking up the cakes. Baking powder activates twice – first, when it gets wet, and second, when you apply heat. So I take advantage of that first activation and let the batter get bigger and more bubbly. It works – and it doesn’t need any sort of “frenzy” first thing in the morning. Fluffy yet moist thanks to mashed banana mixed into the batter, these pancakes make for the perfect weekend morning breakfast. But honestly? If you’ve got 15 extra minutes on a weekday morning, give them a go then, too. They’re ridiculously easy and come together in no time. Great recipe, better if you add about a tablespoon of cinnamon and a smidge extra banana, it is the only pancakes we make for Saturday morning that do not require butter or syrup. The kids devour them and next time I am going to add a little bit of crushed walnuts, will let you know how they turn out. Can you make the batter the night before and still get them to turn out nicely? Today @ my ripe old age I made perfect banana pancakes thanks to this excellent recipe. Very light,fluffy and tasty. Thorougly enjoyed and served as brunch so I have free afternoon. There is no age bar to learning. Thanku for this yummy recipe. I’m eating these as we speak. I’m not usually a pancake fan, but these are DELICIOUS and turned out just like your photo! Our neighbor dropped off a grocery bag full of ripe bananas because she’s heading off on vacation and we needed something to do with them. These were perfect! Thanks! Oh my gosh!!! These are absolutely delicious!!! We made them without the bananas today, (didn’t have any on hand) and they turned out wonderful! I will be making this recipe from now on whenever we have pancakes! Thsnk you so much! I googled buttermilk and banana recipes this morning and this recipe came up. I am so thankful. My kids love them. They seem pretty healthy for pancakes too. This is my go to recipe now! I just made these this morning and they are DELISH. I served mine with a sprinkling of chopped toasted and slightly salted walnuts, some diced banana, a scoop of clotted cream and sprinkling of powdered sugar. They are really nice, not too sweet.. And if you wanted them a little sweeter, a drizzle of honey or real maple syrup kicks it up a notch. Thank you for sharing this recipe, I will make it regularly now!! elevates this recipe to another gustatory level. Next time may experiment using Stevia as I am insulin resistant, though I worry it may work well as a substitute. Has anyone tried it? Those sound amazing! I’ve not tried Stevia but hopefully someone has and can provide feedback! These pancakes call for so little sugar that it probably won’t affect them too much. One of those one-for-one Stevia substitutes would especially probably pretty well. If you try it please report back! Been making banana pancakes for kids and grandkids 60 yrs., hit a home run with this one, it is now in my permanent forever cookbook to be passed down. We had breakfast for supper with these last nt. and everyone had seconds. These are the “Real Thing”. Oh my! These sound so good! 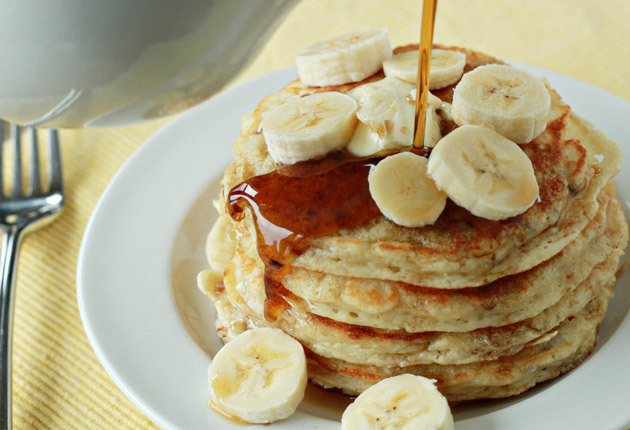 This are the best banana pancakes ever! My kid said momma file that recipe right now. Thank you. 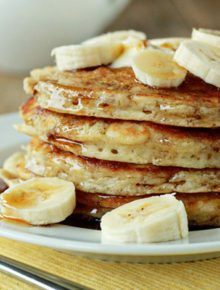 Was searching for a banana pancake recipe and was hoping this one would work. Oh my gosh!!! They were the most delicious, and incredibly fluffy pancakes ever .. and the flavour was amazing. Will definitely be making this recipe many times more! I made these and they were very good! I did halved the ingredients bc I only had 1 small banana n really wanted to make these. I know it’s a banana recipe but can I sub the fruit with, say, apples n applesauce? Just curious. I did have left over apple wedges so I thinly sliced n added them. Used maple syrup instead of sugar n organic whole wheat flour. Mines didn’t turn out fluffy like yours. Not sure if the apples affect it or the banana being too riped (almost black). But my batched yielded 9 pancakes. I did use an icecream scoop. Any suggestions? Great recipe, thanks so much! I decreased the sugar by about half, which was perfect since we ate them with maple syrup. I used three small bananas also added some crushed walnuts – the crunch made these fluffy pancakes delicious. * I would also like to note I used the vinegar and milk substitute instead of buttermilk and it worked out great! Love, love this recipe. I use coconut oil and coconut palm sugar. All purpose flour is plain flour, just a different name. My family loves these pancakes! We make extra to freeze and they heat beautifully in the toaster on school days. Superb recipe, they turn out just as fluffy as they are pictured. I made them last weekend and I’m making them again tomorrow. I added the cinnamon suggestion from one of the comments and they really are so tasty that they don’t need any toppings at all. We can’t get hold of buttermilk over here so I made them with the vinegar option and it turned out better than I had expected (first time using buttermilk). 5 star pancake recipe! We made these Fluffy Banana Pancakes for Christmas Eve breakfast 2016. Fluffy goodness! I had mine with breakfast sausages, blueberry jam and French vanilla ice cream. My sister and mom had theirs with breakfast sausage, maple syrup and French vanilla ice cream. Very, very filling pancake. I had 2 x 7 inch pancakes and would have had enough with only 1 instead. Thanks so much for sharing the wonderful recipe! Hi David, this is the first I’ve heard of these not working out for someone. Can I help you troubleshoot? They definitely should rise! These are seriously the BEST pancakes! Fluffy and tender! Everyone who has tried them, loves them. I have shared your recipe with everyone I know! Thank you for sharing! Excellent with slivered almonds in the batter and almond butter and maple syrup on top. Keeper! I made these last night for dinner, very impressed with the recipe. I used full cream milk to make the buttermilk, olive oil instead of butter, and my own sugar mix (half golden caster/half Demerara). I also used Aussie metric cups, and I got 14 big fluffy pancakes. Hubby was also impressed with them, and he’s a crepe man lol. Thanks for a great recipe, I’ll be putting this in rotation frequently. Amazing! My kids love this recipe. Thanks heaps. These were delicious! These are definitely one of the fluffiest! So good and they taste so wholesome! Seriously, one of the best breakfast recipes I have ever made. These are the best pancakes I’ve ever made. Perfect color, fluffy texture. Just delicious! These pancakes are sooooooo awesome……Light,fluffy and just plain AMAZING…….I always get scared and shy away from recipes that say do not over mix cause i’m scared of over mixing but these just sounded and looked soooooo good……It took me 2 days to get the courage to make them and boy am I glad I did…….Thank you sooooo very much for sharing this recipe…….It was nice to have something different to do with bananas. Oh I’m so glad you powered through and even happier you liked the recipe! Whew! 🙂 I swear I have had so many overripe bananas lately, I need to make some of these this weekend I think. Hi… great recipe ..my kid loves it! Could i store the batter for the next day? I love to use buttermilk in pancakes so I decided to try this recipe out. I adjusted slightly with the flour to make it a little more healthy for my family. Added 1/2 cup oatmeal, 1/4 cup wheat germ and decreased the flour by 1/2 cup. These came out so fluffy and delicious! My husband was very impressed and I have made a lot of pancakes! I’ve kept them in the fridge overnight and pop them in the toaster in the morning; not quite as good as fresh but you can’t beat the convenience! I also like to freeze them in a single layer on a cookie sheet, stuff them in a freezer bag, pull out a few to thaw for about 15 minutes at room temp, then pop in the toaster. Thank you thank you! Delicious for my toddler & solely meat-eating father! Peace in the am kitchen! Delicious! Can’t wait to make them again…. 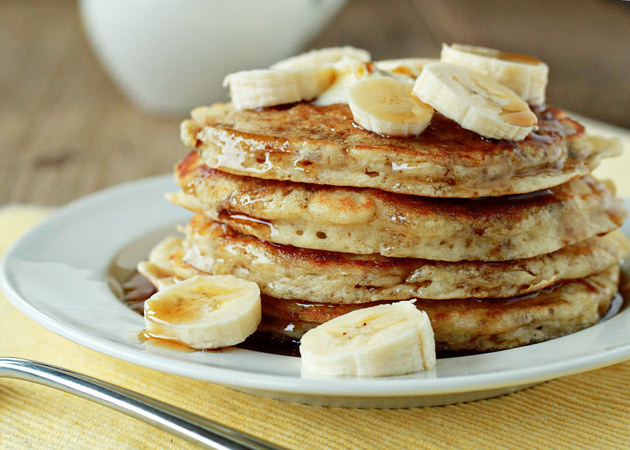 This has always been my go-to banana pancakes. Awesome recipe, thank you!! I made this! It was really good. And fluffy! I was out of sugar so there’s no sugar added. Besides, the bananas i used were ripe enough and very sweet. Awesome for those who are cutting back on sugar. Promise it was so fluffy and tasty. The sugarless recipe did not negatively affect the pancakeyness. Thank you for this recipe. But the recipe is made for a family, I have the house to myself for the wekend so still have some batter left in the ref. Looks like pancakes for dinner! Awesome! Just made this recipe using apple cider vinegar and fairlife 1% milk for a buttermilk substitute and 3 frozen bananas. Also made waffles instead of pancakes. They turned out so well, moist and flavorful! I will never make waffles any other way!! Oooh, delicious! Can’t wait to try this as waffles! Thanks so much for sharing.